Read the opposing arguments from Sports Geek and Loyal Homer. Just when we all thought the conference reshuffling was over in college football it is announced that TCU is joining the Big East. Folks across the country have had the opportunity to register their reactions by now. Or, rather, the lack of reaction. It seems that this news was met with a large scale shrug of the shoulders. 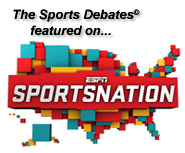 At The Sports Debates, we believe this issue is far more interesting than just a shrug of the shoulders. It is a supposed major football conference adding a team of some national importance. Today’s debate question: Is TCU’s decision to join the Big East conference a good one? Sports Geek will argue that the decision is not a good one while Loyal Homer will argue that it is. It doesn’t get more cut and dry, writers. Let the debate begin! This entry was posted on Monday, December 6th, 2010 at 11:26 pm and is filed under The TCU To the Big East Debate. You can follow any responses to this entry through the RSS 2.0 feed. You can leave a response, or trackback from your own site.